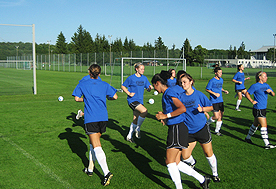 Sports Travel Agency is well aware of the fact that the training sessions are certainly among the most important components to make your soccer trip a complete success. You can tell us your preferred training schedule and we will work it into the itinerary so that it suits you the best way possible. If you want experienced German coaches to run some of your training sessions you can tell us prior to your stay and we can arrange it for you. 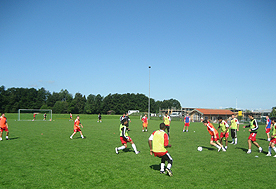 For your training sessions there are available several nicely treated grass fields, flood light attached, which are in short walking distance from the hotel. There are even more fields available within a short bus drive that we will arrange if needed. 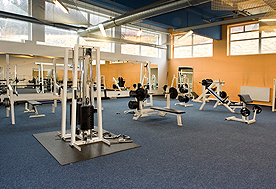 The facilities also provide locker rooms and a massage room as well as practice equipment that soccer training sessions generally require. A physiotherapist is available and can be booked if you specifically ask for it prior to your stay. Bottled Water as well as ice for injury treatment will be provided. 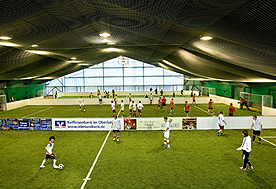 The hotel also holds three ultra modern indoor soccer fields with cage system, wrap-around barrier system, and a playing area size of 14 m x 30 m. The fields are covered with the most modern granulate-filled Prestige XT Astro Turf system that has got most nature-like and joint resting characteristics. The indoor fields are accessible directly from the hotel and have been used appreciatively by many teams whenever there are bad weather conditions, for particular technical skill training or whenever they are simply in the mood for little fun tournaments. Also accessible from the hotel is the 5000 m² sport park with 1200 m² fitness area, spinning room, indoor tennis, squash, sauna, solarium, vapor bath, climbing wall and table tennis. The sport park will give you the opportunity to add different training ingredients to your regular soccer training whenever you like. If it is weight training with an equipment of the latest generation or endurance training on treadmill or bicycle ergometer, you decide what you want to add to your schedule. Just a few footfalls away from the hotel is the brand new outdoor beach soccer field that you are free to use whenever you like. The playing area of the field is the size of 18 m x 34 m. That way you can experience beach soccer feeling embedded in the middle of a mountain landscape. Due to the country and mountain landscape that surrounds the facilities it can also be highly recommended to take your team on nature, mountain or forest runs. You can start most of the runs right from the hotel.